The process State view shows the global SmartDeviceLink states according to system life cycle. SDL creates and initializes component according to configuration file. If all SDL subsystems successfully started, SDL starts waiting HMI and mobile connections. If failed, SmartDeviceLink is shutting down. SDL waits for an HMI connection. 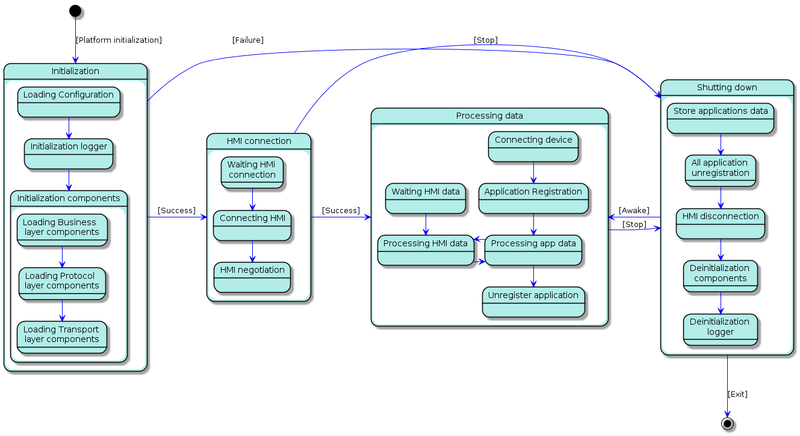 If HMI successfully connected, SDL starts processing all mobile data. On receiving stop signal SmartDeviceLink is shutting down. SDL handles HMI and mobile data and proceed according to business requirements. SDL starts shutdown procedure on getting stop signal from HMI or OS. SDL stores all resumption data, unregisters all mobile applications, disconnects from HMI and denitializes all components. Continue processing data on getting Awake command from HMI.